By now the history of compositions for computer and conventional instruments is pretty long, over 60 years give or take, Varese's Deserts from 1950 or so being the first important work that comes to mind. And after that many years being exposed to electronic music, and its entrance into the pop world in various guises, we no longer find it so much an exotic world. I can remember nightly newscasts on TV as a kid that took advantage of sometimes crude computer themes as part of their sign off/sign off. It was the cutting edge of sonority and a sign of the space age, though often enough there wasn't much substance, musically speaking. The world of classical-modernism spawned some masterpieces over the years and I need not rehearse them. Suffice to say it is an integral part of the contemporary scene now. 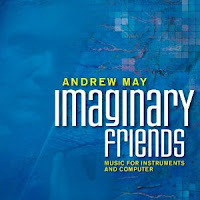 Enter composer Andrew May and his album Imaginary Friends (Ravello 7861). 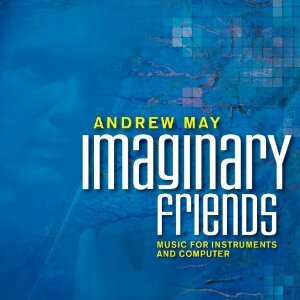 It groups together seven of his works for instruments and computer, all of solid modernist construction, seamless integration of acoustic and electric sounds, and high musical interest. This is his first release and I must say I am pleased and impressed with his knack for creating works that display orchestrally complex sound worlds. There are five works for a single instrument and computer sounds: piano, clarinet, 5-string electric violin and two for flute, respectively. There is one for two clarinets and electronics, and a final, longish work for electronics and chamber ensemble. May convinces, sounds contemporary without attaching to any particular stylistic school, and gives the lover of the new much to hear and appreciate.